Wayne Harvey with his superb 26lb carp. We have some fine waters in the area that continue to produce big fish. Local anglers don’t have to travel far to come into contact with specimen carp. Sands Lake at Float Fish Farm Fishery is a relative newcomer to the specimen scene but is already attracting big-fish anglers to its banks. The fish are stunning and in great condition. Turves rod Wayne Harvey has become a regular visitor to the water and has had some great success but on his latest trip it didn’t go to plan at first. He arrived at the lake last Thursday morning but with nothing showing for the first 24 hours he decided to continue feeding by topping up with a handful of bait every four hours. At long last on Friday afternoon fish started rolling over the spot he had been pre-baiting with his home-made boilies and the end result was a stunning 26lb 1oz common. It was his only fish from the two-day session but surely was worth the wait. A special mention for John Whincup. The city rod fished the prestigious Maver Festival at Whiteacres down in Cornwall last week and topped a very impressive line-up which included international anglers. 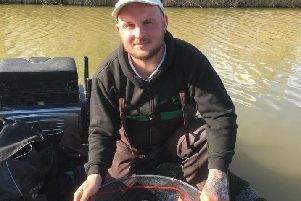 Sunday’s Haddon Lodge Fishery Open was won by Gordon Harmer with 16lb 6oz followed by Andy Perry with 14lb 12oz and young Jamie Wilson with 8lb 6oz.